If this is your first time watching polo a little knowledge will make your day more enjoyable. The rules are very straight forward and easy to grasp. Each team has 4 members with a distinct position, as shown by the number on their shirt. • No 1 is essentially a goal striker though any team member may score a goal. • No 2 also a forward but plays harder especially on defence. • No 3 is the pivotal player between offence and defence who tries to turn all plays to offence. He is usually the highest rated player on the team. • No 4 or back is the most defensive player whose primary responsibility is to protect the goal area. • The game is divided into six chukkas (from the Indian word for a circle or round) each lasting 7 minutes and a 3 minute interval between to allow the players to change horses. • The chukka is over if during the final 30 second period the ball hits the sideboards, goes out of play or the umpire blows his whistle. Another chukka is played until a goal is scored if the scores are tied at the end of the final chukka. • Play starts with the umpire throwing in the ball between the two teams. In the same way play is occurs after a goal or if the ball goes out over the sideboards. • If the ball goes over the backline there is a hit-in by the defenders. • There is no offside in polo. • If the defending team hits the ball over their own goal line the attacking team takes a free shot at goal from 55 meters out from where the ball crossed the goal line. • The teams change ends whenever a goal is scored to negate any ground or weather advantage. • A player may challenge an opposing member by riding him off (bumping him) during general play. 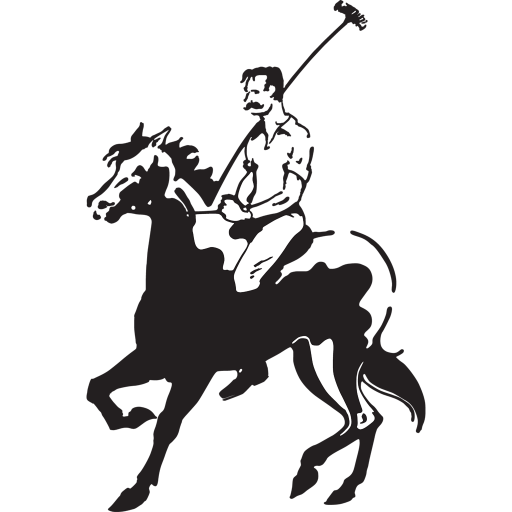 He may also hook the opponent’s stick just as they are about to hit the ball, providing it is done on the same side as the ball (ie not across the horse). In riding off, a player can prevent an opponent taking an active part, but the angle of the ‘bump’ must not be dangerous to either player or pony. The horses are the ones intended to do the pushing, but a player may use his body but not his elbows. • Two mounted umpires control the game. After they have blown their whistle for an infringement they often consult each other on the severity of the foul. Should they disagree they can seek the opinion of the referee or ‘third man’ as he is often known. • At half time, it is a long standing tradition that the spectators walk onto the field to “stomp the divots” made by the ponies hooves. • All players are rated from -2 to 10 (the higher the better). • The team handicap is the sum of its players’ handicaps. • The highest handicapped player in Australia is 7 goals. • The team with the highest handicap gives the difference to the other team, eg, a 6-goal team gives two goals to a 4-goal team (ie usually played on handicap). • The field is 275 metres long by 180 metres wide, although if it is boarded it need only be 150 metres wide. • The goal posts are 7.3 metres apart, 3 metres in height, open at the top and collapsible on impact. • A polo player must have a helmet, knee guards and a polo stick. The stick is pliable and hits of up to 150 metres are not unknown. The ball, once made of bamboo (9cm diameter), is now made of plastic and although only 130 grams is remarkably hard if it hits you. • The ball is hit with the side of the mallet not the end as in croquet. • Please stay behind barriers. Do not approach the field during a game. The field extends 10 metres beyond the red boards. • Do not approach the horses and do not pat them. • Please keep dogs on leads.